Medieval Conquest Game Review - Download and Play Free Version! Build your kingdom and legacy by hunting down and killing dangerous monsters in this medieval adventure! Over 100 options for investing in weapons, armor, entertainment, adventures, buildings, etc. Build a kingdom and forge your destiny! You have been hired by the King to seek and destroy monsters that have been ravaging the town. As you kill each monster, you will be paid and with the earnings you will need to keep your men loyal and healthy. You will gradually build taverns so they can relax and carnivals for them to play in as well as inns for recovery. If you decide you need more money and forget to pay your men, they will wander off and find better work. Like other RPG games, the men will increase in both skill and strength as they progress through more missions. Much of this due to the fact you will buy them better weapons and train the men, but the practice certainly helps them too. You will have the chance to kill monsters and cast spells in this medieval adventure. The monsters will provide the central theme to this game as they are the ones causing all of the havoc. The monsters do taunt you and you will find certain elements of this game light-hearted and humorous. But if you can't hunt the monsters down and kill them, game over and thanks for playing! Medieval Conquest blends elements of role playing and real time strategy games. If you are interested in those, give this one a shot. In Medieval Conquest you are in charge of building a town and hiring adventurers to vanquish the enemies of the kingdom. It is your duty to provide the adventurers with everything they might need to scour the land in search of enemies and treasure. In this RTS game that includes elements from role play games (RPG) and business tycoon games, you will be constantly busy trying to keep up with the game. The storyline is similar to most medieval RTS games, you must save the kingdom from some evil doer that is trying to take over. Medieval Conquest uses this and pokes a little fun at the norm. The characters dialogue and all the foes you fight show that this game isn't too serious about the story. Frequently adventurers will shout “I have vanquished thee.”. The monsters are also a little silly. Several different sizes and colors of what appear to be beetles are some of the more frequent monsters you encounter. The various one liners will keep you laughing if you keep the sound on and watch the battles play out. The gameplay is different than most RTS games. Your control is more focused on building the support adventurers will need and then hiring the adventurers. The only control you have over adventurers, the people who do the fighting, is to tell them where to hunt. You will need to build a town that has places for adventurers to rest, eat, play and train. Buildings such as armories and blacksmiths will provide the fighters with much needed weapons and armor. The adventurers also have a small RPG element, they level up as they kill monsters allowing them to purchase more advanced weapons and armor. This addition makes keeping your troops alive necessary to build the strongest army you can. Also, adventurers get more and more expensive to hire each time you hire a new one. 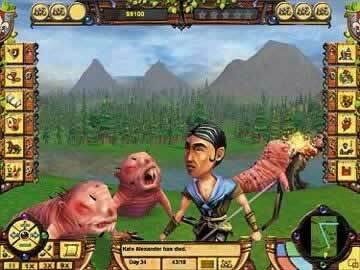 Instead of gathering gold, you receive a bounty for killing monsters. Since gold is the only resource in the game, you will have to spend it wisely. 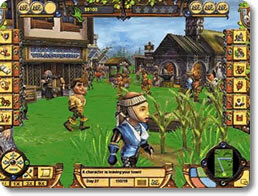 The game consists of four large maps that have various missions to accomplish. Each mission will take a substantial amount of time to complete so you will be busy for a while. The visuals in Medieval Conquest are one of the best parts. The graphics aren't the greatest but they have a level of detail not seen in many RTS games. You can zoom in to the level of the characters and almost walk through the town as though you were there. Each building is well detailed and includes signs and staff that work at the various shops. The ability to put the camera at the level and angle of people means you can watch all the excitement first hand. Medieval conquest is not without flaws. The tutorial is seriously lacking. There is not much more than a few pop up windows that explain a few of the details of the game, but not nearly enough. All of the buildings and options are available from the beginning so without direction you could easily feel lost. Also the game has a reputation meter that can reduce or increase the cost of adventurers based on how high your reputation is. Maintaining reputation is nearly impossible since you are frequently ambushed by hordes of enemies and even a single death causes one of five stars to be lost and you must kill a large number of enemies to get that one star back. Additionally, if your reputation is too low, your adventurers might leave and never come back. With a mix of RTS, RPG and Tycoon style business management, Medieval Conquest will have something for everyone. The steep learning curve will take some dedication from players who are less familiar with RTS style play and might even cause a bit of confusion to those who are familiar. Any RTS fan should definitely check out this game. If you are new to RTS games this might not be the game for you but if you are willing to put in the time to learn the game it could be fun.